This weekend Cambodians are expected to protest Beijing’s influence over Hun Sen’s government. China has emerged as a major focus ahead of protests by Cambodia’s rowdy opposition scheduled for this Saturday. Prominent politicians are warning that the government has given too much ground to Beijing, which they fear is threatening to overrun the tiny Southeast Asian nation. Opposition heavyweight Son Chay led the attack by the Cambodian National Rescue Party (CNRP), accusing China of exploiting and cheating Cambodians, in an interview published in the latest issue of the Southeast Asia Globe. China has emerged as Cambodia’s biggest benefactor over the last two decades, plowing more than $11 billion into the country largely through soft loans which it says come with no strings attached. However, Chinese companies have won enormous economic land concessions from the Cambodian government, which has also defied the wishes of its neighbors and backed Beijing over its stance in the South China Sea, where the Middle Kingdom has competing sovereign claims with Vietnam, The Philippines, Malaysia and Brunei. “They are willing to supply loans for roads, bridges and hydro damns, but they must go through Chinese companies who multiply the real costs so they can make huge profits,” he added. It’s an attack the government has been unusually quick to defend. Cambodian Red Cross President Bun Rany, who is also wife of Prime Minister Hun Sen, said Cambodia and China were "brothers" and were always ready to help each other in difficult times. "Cambodia considers China as an older brother and Cambodia is a younger brother," she said during a meeting with the new Chinese Ambassador to Cambodia, Bu Jianguo. Bu earned herself some unwanted diplomatic attention before the July elections when the Chinese state publication Xinhua appeared to preempt the election result by announcing she had just arrived and was looking forward to working with Hun Sen’s government over the longer term—despite the fact that an election, with eight contesting parties, was imminent. Cambodia’s relationship with China has blossomed since December 2010 when the pair signed the Comprehensive Strategic Partnership of Cooperation. Relations also improved with Western countries aggravating Hun Sen by attaching human rights demands to foreign aid packages. The sticking point for Hun Sen and his ruling Cambodian People’s Party (CPP), however, remains the Khmer Rouge. And fraternizing with the Chinese is not always considered good politics. Middle-aged Cambodians have long memories and China was the only country to actively support Pol Pot while his maniacal band of ultra-Maoists were in power between 1975 and early 1979, a period during which as many as 2.2 million people died through slave labor, famine, illness, or simple extermination. After realizing what was happening, Eastern bloc communist countries abandoned the Khmer Rouge. It’s a sore point the CNRP will attempt drive home at demonstrations this Saturday, called over allegations of cheating by the CPP at the July poll. 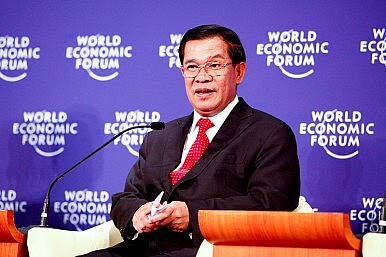 Hun Sen won but with a sharply reduced majority despite the electoral irregularities that favored his party. The granting of land concessions to China was widely seen as major contributing factor to that poor performance.